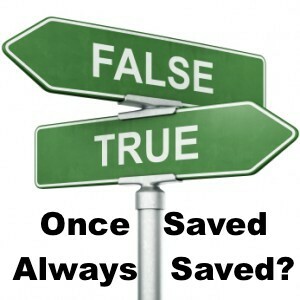 Many Protestants understand being “saved” as a one-moment-in-time act of repentance and acceptance of Jesus Christ as one’s “personal Lord and savior” (a phrase that nowhere appears in the Bible, by the way), a life-changing transformation of “lost” sinner who becomes a “saved” child of God. They believe this to be an irrevocable step that eliminates the penalties of past sins and guarantees, no matter what might happen from that point forward, that nothing can undo or rescind one’s salvation. St. John’s assurance that “you have eternal life” is a proclamation of every Christian’s moral—not absolute—assurance of salvation. Christ offers us the gift of salvation, and he will not go back on his word. If we have died with him, we shall also live with him; if we endure, we shall also reign with him; if we deny him, he also will deny us; if we are faithless, he remains faithful— for he cannot deny himself. Take care to notice the particular “if” in this passage. So while it’s true that we may indeed “have” salvation, whether or not we keep our grasp on it is another matter, as St. Paul will demonstrate below. They [i.e., those who lost their salvation by rejecting Christ] were broken off because of their unbelief, but you stand fast only through faith. So do not become proud, but stand in awe. For if God did not spare the natural branches, neither will he spare you. Note then the kindness and the severity of God: severity toward those who have fallen, but God’s kindness to you, provided you continue in his kindness; otherwise you too will be cut off. The “you” to whom he’s addressing this warning are gentile Christians whom he likens to branches from a “wild olive tree” that had been grafted onto the cultivated tree in places where the natural branches had been snapped off. Note well the warning he gives these gentile Christians regarding the possibility that they too could lose their salvation. Hebrews 10:26–31: [I]f we sin deliberately after receiving the knowledge of the truth, there no longer remains a sacrifice for sins, but a fearful prospect of judgment, and a fury of fire which will consume the adversaries. . . . How much worse punishment do you think will be deserved by the man who has spurned the Son of God, and profaned the blood of the covenant by which he was sanctified, and outraged the Spirit of grace? For we know him who said, ‘Vengeance is mine, I will repay.’ And again, ‘The Lord will judge his people.’ It is a fearful thing to fall into the hands of the living God. Ask yourself: Is there any way someone could “escape the defilements of the world” other than by God’s grace and forgiveness (what many refer to as being “saved”)? No. So this means that some who been saved fall back into grievous sin, thereby losing their salvation. And recall the unforgiving servant in Matthew 18:21-35. He’s a perfect parallel with the sinner who repents, pleads for mercy, and was forgiven by God and his debt of sin wiped out. But the unforgiving servant proceeded to mistreat a fellow servant and when the King discovered this, he reinstated his debt and threw him into prison. The Bible is clear that, tragically, Christians can indeed lose their salvation by sinful rebellion against God. As the Lord himself declared, “So also my heavenly Father will do to every one of you, if you do not forgive your brother from your heart” (Matt. 18:35). Ask yourself: Why would Christ warn us about this, if there was no danger that it could happen? See these additional verses for more study: Matt. 7:21-23; Matt. 10:22; John 5:29; Rom. 2:5-11; Rom. 8;24-25; 1 Cor. 9:27; 1 Cor. 10:12; Heb. 6:11; Phil. 2:12-13; 1 John 3:21-24; 1 John 4:20-21.